On Friday, the first-term mayor got to celebrate a proud piece of city history by unveiling a monument bearing a plaque marking a site believed to be an Underground Railroad stop. “I think at one point we had the biggest stone dam,” Rivera said. “We had the biggest clock tower in the world. We had the most mill brick in the world. The monument is in front of the Lawrence branch of Metro Credit Union and marks the site of the former home of Daniel Saunders, a founding father of the city who was said to shelter people escaping slavery before the Civil War. Saunders “made this site a place for people to stay and hide and ultimately move onto a better life,” said Robert Cashman, the credit union’s president and chief executive. The monument is the first to honor Lawrence’s role in the Underground Railroad, said Jonas Stundza, chairman of the Lawrence Historical Commission. Saunders’ home is one of several connections Lawrence has to the abolitionist movement and the network of secret routes and stops used by fugitive slaves to escape to free states and Canada with the help of their allies, Stundza said. Abbott Lawrence, the city’s namesake, was involved in the antislavery movement, and a house on High Street was also believed to be a stop on the Underground Railroad, said Stundza. Saunders, who was born in Salem, N.H., purchased a brick house on the site of what is now the credit union in 1847 and lived there until his death in 1872, Stundza said. Slaves came to his house after stopping in Andover at the home of William Poor, who made wagons with false bottoms to smuggle people along the route, Stundza said. Saunders’ role in the Underground Railroad became known publicly when his contemporary and colleague Robert Tewksbury, a city historian and former mayor, wrote about it while preparing a history of Lawrence that was first published before World War I, Stundza said. Tewksbury amassed the history while recording stories told at meetings of the city’s Old Residents’ Association, Stundza said. Saunders’ former home was torn down in 1949, according to a 1966 newspaper account provided by the credit union. 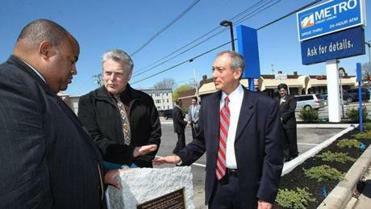 The credit union has been located on the site since 1986, Cashman said. When the bank decided to add parking and a drive-through automated teller machine, it purchased neighboring property, including a house that once belonged to Saunders’s son, Caleb, Stundza said. The home had been drastically changed over the years and was torn down last summer. A piece of the granite foundation was made into a monument to hold a plaque marking Saunders’s homestead.